Ratheesh Nair – director of the Russian Cultural Center in Trivandrum (Thiruvananthapuram), India, where he is also an Honorary Consul of the Russian Federation – is a rather unusual person. To begin with, he speaks Russian fluently, although he did not study to become a Russian specialist. He simply and quite literally fell in love with Russian literature. And he also has a taste for Russian cuisine. Furthermore, Ratheesh is friends with employees of the Esenin Museum in Moscow, which is where we met with him. Where did you learn to speak Russian so well? When I studied at the State College of Management in Trivandrum, I was the secretary of the Society of Friends of the Soviet Union as well as a member of the Soviet Cultural Center, which at that time was headed by Valery Budaragin. And then I received a scholarship to travel to the Soviet Union and study to become a doctor, first in Vinnitsa and later in Chernovtsy. At that time I knew very little Russia, as I was just begin to study the language. Not particularly. I was immersed in a Russian-language environment. At the beginning I encountered some rather amusing situations in Ukraine. For example, a few days after arriving I went to the market to buy some potatoes. But at that time I didn’t know what they were called in Russian. So I walked up to one of the saleswomen, pointed at the potatoes and asked, “What is your name?” “Tanya,” she responds. So I said, “Give me two kilograms of Tanya, please…” Of course we had big laugh. But I also wanted to by some eggs and chicken. But I didn’t know how to say chicken in Russian. So I walked up and asked, “Please give me some eggs and their mother.” But at that time there were a lot of foreign students, so the salesladies patiently listened and eventually figured out what we needed. After your return to India, why did you decided to take up the cause of developing cultural ties between Russia and India? The Soviet Cultural Center in Trivandrum opened back in 1975. The Soviet side provided the financing will the Indian side organized all sorts of interesting events. Following the collapse of the USSR, the center was shut down, while the similar centers in New Delhi, Bombay and Calcutta remained open. This was a sad thing for the residents of our city, as we really liked going to the Soviet cultural center. Every week there were showings of Soviet films with English subtitles, there was a great library, concerts were often held… And in 1987 when the Festival of the Soviet Union was held in India a group of 400 cultural works came to Trivandrum! So the closing of the cultural center was a great loss for us. The center sat idle for nearly nine years. And then I met with the director of the cultural center in New Delhi Alexander Sorokin and requested his assistance in reopening the center in Trivandrum. He agreed and I found partners and money for the project. You see, I have always been a friend of the Russian people, and I love your literature. For me this was really important. How did you become acquainted with Russian culture? It was at that Festival of the Soviet Union in 1987. First of all it was your films, which I like very much. Secondly, I became acquainted with the Valery Mashtakov’s gypsy music, which came to the festival. Later I became friends with the family of the center’s director Valery Budaragin and often visited them. These people told me a lot about Russia, about your culture and literature. You see, in India the vast majority of people think of Russia and the Russian people as their friends. It seems that we have a good sense of one another. In Russia people also relate well to India. And by the way, many people are enthralled by Indian films. Where do you think this mutual affection comes from? I think it is thanks to culture, art and literature. Both the Russians and the Indians have something to offer each other in this regard. And it’s great that our peoples express this mutual interest. This is bona fide people’s diplomacy. If someone in India loves to read, then they are sure to be acquainted with Tolstoy, Dostoyevsky and Pushkin just as they are with Rabindranath Tagore. How high is the level of interest in the study of the Russian language in Trivandrum? A rather large number of people want to study Russian. And this desire is to a large degree stimulated by the activities of Russian cultural centers, where people can become acquainted with Russian culture. This generates a lot of interest. How many such centers are functioning in India today? Five, with one each in the cities of New Delhi, Chennai, Calcutta, Mumbai and Trivandrum. Here in Trivandrum we also have a university with a Russian language department. And there is another reason for the high level of interest in Russian language in our state. History plays a role here, as in 1987 the communists won the regional elections in the state Kerala. And they periodically come to power through elections. In general we have a lot of communists, so the level of interest in Russia has traditionally been quite high. I should point out that we even have a village in our state called Moscow. We even have a festival of people with Russian names. Are there a lot of people with such names? Well, at the first festival we had 75 people, including people with such names as Lenin, Pushkin, Khruschev, Stalin and Gagarin. There was even a girl named after [the first woman in space] Tereshkova. But most of the names are more ordinary - Svetlanas, Anastasias, etc. And I even know someone called Sputnik, and he doesn’t even know what the name means. BBC even did a report on the festival. Which Russian writer is held in highest regard in India? I would have to say Alexander Sergeevich Pushkin. He is very popular here. In our state we have one poet who is 77 years old, and he is called Kerala’s Pushkin, as he translated a lot of Pushkin’s works into the language of our state – Malayalam. We even gave him a special award for translators who help popularize Russian literature. The most popular novel in Kerala is called in our language Oru Sankeerthanam Poole. It is about Dostoyevsky’s life and is written by someone who doesn’t know Russian and has never been to Russia. But he loves Dostoyevsky, and particularly The Brothers Karamazov. And so he wrote this novel about the love between Dostoevsky and his wife Anna. And I would very much like to speak with the Russian Embassy in India about helping organize a trip of our writer to St. Petersburg. Tolstoy and Chekhov are also very popular here. And following the exhibition of the Moscow Sergei Esenin Museum in Trivandrum, interest in this poet is on the rise. Now we would like to translate a collection of his poems into our language and publish it. I suggested that each one of our poets translate a poem of Esenin for the collection, and I think that this will be very interesting. What else would I like to do? It is great that people in our area love Pushkin, Tolstoy, Dostoyevsky and Chekhov, but I think that it is also necessary to translate contemporary Russian writers. We really do not have any exposure to them. Does India still remember Nikolai Roerich? Thank you for this question. Nikolai Roerich will never be forgotten in India. Our country honors his memory, and this is particularly true in Trivandrum. A street near our Russian center was renamed, at our request, in honor of the painter. We have a museum where the works of Nikolai and Svyatislav Roerich are on display. In Kerala Nikolai and Svyatislav known, respected and remembered, and each year we celebrate the birthdays of Nikolai, Svyatislav and Yuri Roerich. 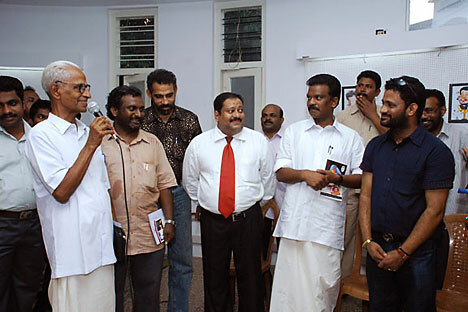 In Trivandrum a project for virtual Russian language lessons has been launched. Could you tell us a little more about this? India has a special satellite called EduSate, which is devoted entirely to educational programs. And in Kerala we have the special educational television channel Vistels. I requested that the Ministry of Education allocate a half an hour each month for Russian language classes, and they were agreeable, so we started our cooperation. That was four years ago. The program was opened by Sergei Kiriyenko [head of Rosatom, which is building a nuclear power plant in the Kerala region]. And this year we launched virtual Russian language classes, which take place every Saturday. How many students study in the Russian language department at the University of Trivandrum? Each year 40-50 people enter the program, and a slightly lower number graduate. Many people study at our center as well, as we offer classes at various levels. You have just met with representatives of the Russkiy Mir Foundation. Do you intend to set up some cooperative programs with the foundation? If everything goes as planned, we would like the Russkiy Mir Foundation to open a Russkiy Mir Cabinet at our center. Earlier we had a very good library of Russian literature and we would like to bring it back to life. This is one area where we could cooperate with the foundation. We would like to turn our center into a Russia House and organize all sorts of activities. We would very much like to have teachers from Russia help raise the quality of our language instruction offerings. And I also have another dream. It would be great if once a month a well known Russian author came to visit. Furthermore, I would like to establish relations between our state and Russian provinces. We would be delighted to welcome cultural figures from various regions of Russia.